In this unique construction book for kids who love tools and trucks, readers join a girl and her family as they pack up their old house in town and set out to build a new one in the country. Mom and Dad are going to make the new house themselves, from the ground up. From empty lot to finished home, every stage of their year-and-a-half-long building project is here. And at every step their lucky kids are watching and getting their hands dirty, in page after page brimming with machines, vehicles, and all kinds of house-making activities! 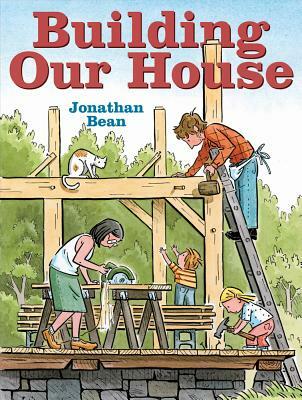 As he imagines it through the eyes of his older sister, Building Our House is Jonathan Bean's retelling of his own family's true experience, and includes an afterword with photographs from the author's collection.